FTP Commander Password Decryptor is the FREE software to instantly recover FTP login passwords stored by FTPCommander- one of the popular FTP clients. All versions of FTPCommander stores the FTP account passwords in a file called "ftplist.txt" in an encoded format. FTP Commander Password Decryptor makes it easy to quickly scan & decrypt all these encrypted FTP passwords. Recover FTPCommander passwords from local as well as remote system. 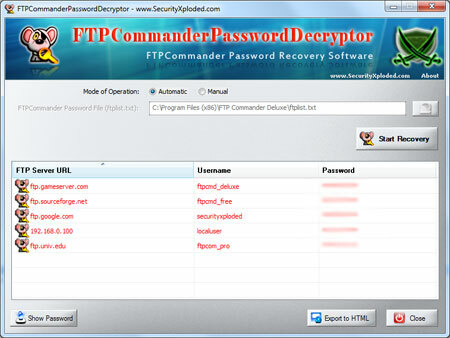 FTP Commander Password Decryptor is FTPCommander Password Recovery Software. ...... FTP Commander Password Decryptor supports automatic and manual mode, in automatic mode it will instantly scan and recover FTP passwords from all versions of FTP commander. In manual mode, user can specify local/remote password file (ftplist.txt) and recover the passwords. * Supports all editions including FTPCommander, FTPCommander Pro & FTPCommander Deluxe. * Comes with both GUI interface & Command-line version. * Useful for Penetration testers as well as Forensic investigators. * Recover FTPCommander passwords from local as well as remote system. * Save the recovered password list to HTML file for transferring to other system or for future use. * Support for local Installation and uninstallation of the software. Displays logins and passwords for FTP accounts. Qweas is providing links to FTP Commander Password Decryptor 1.0 as a courtesy, and makes no representations regarding FTP Commander Password Decryptor or any other applications or any information related thereto. Any questions, complaints or claims regarding this application FTP Commander Password Decryptor 1.0 must be directed to the appropriate software vendor. You may click the publisher link of FTP Commander Password Decryptor on the top of this page to get more details about the vendor.